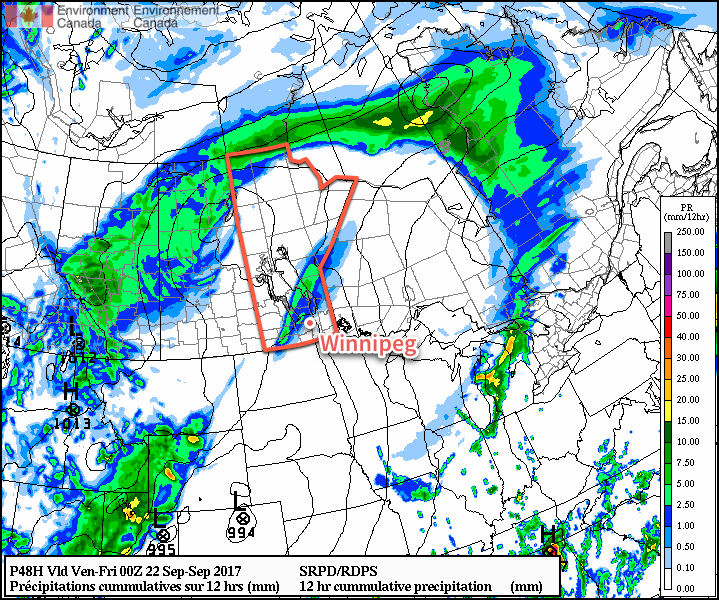 Winnipeg and area will continue to see a variety of generally unsettled weather ahead thanks to a persistent as a south-to-southwesterly flow aloft continues throughout the remainder of the week. Today will be the nicest day of the next few as a few remaining showers clear out from last night’s activity early this morning, leaving the region with sunny skies for the rest of the day. Winds will be out of the southwest at around 30 gusting 50 km/h all day with temperatures climbing to a high near 20°C. Tonight, temperatures will dip to a low near 11°C with winds out of the south at around 20 km/h. Thursday will see the winds taper off through the morning as skies cloud over. A chance of showers will persist much of the day1 and then taper off in the evening. Temperatures will climb to a high near 18°C. Skies will clear out overnight with temperatures dipping to a low near 10°C with light winds shifting to the north. Friday will once again see cloud move in early in the day with winds picking up out of the north to northeast to around 15-25 km/h. There will be another chance for light showers throughout the day, but it looks like they will be light and scattered. Temperatures will climb to a high near 18°C. Skies will remain mostly cloudy on Friday night with temperatures dipping to a low near 9°C. The long range forecast continues to provide more of the same, with guidance suggesting cloudy skies throughout the weekend and into the start of next week. Another system will pass through on Saturday night, bringing the potential for another round of organized rainfall, followed by another system Sunday night into Monday. Temperatures will be below normal through this entire period with winds out of the north to northeast. So not the nicest fall weather ahead, but potentially some more needed rain coming to the region. Winnipeg’s seasonal daytime high is currently 17°C while the seasonal overnight low is 5°C.